Hi guys…. this isn’t really a post.. but I thought I’d share this pic with you. 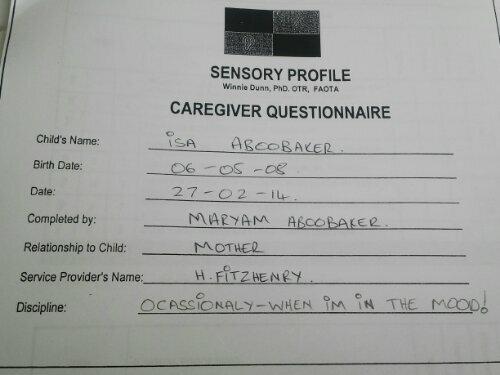 Needless to say I will be filling in all future forms by myself! I had a chat the other day with someone who brought to mind the subject of this post… The over eager-pill-popping-antibiotic giving-diagnosis-obsessed-self-employed-therapist-Dr-Google mothers we have become. It’s a well-known fact the mothers are generally over protective by nature. I am a South African (Indian) mother, so I know full well that it is in my best interest (and yours) to never EVER cross another mother or her child. She will no doubt hunt you down, tell the neighbours, come over to your house, demand a disciplinary hearing, request the test be remarked, or do whatever necessary to protect her child and ensure he/she has not been harmed or lost out in anyway. And for the most part this is acceptable, so I’m not saying that it’s ALWAYS unjustified….I’m just saying it’s probably justified 10% of the time. Are we not taking things a bit too far? I know I over analyse everything in my life and this is a disease I’m working on. Last June my sisters had an intervention at my home, because apparently I have unrealistic expectations of my 5 year old. (What! Me- is it that unrealistic to expect him to behave in a manner well beyond his 5 years of existence?) Yes, ok…. (I did kiiinnndd off self-diagnose him with low muscle tone and his younger sibling of having ADHD tendencies) so I admitted my guilt, because I don’t want him to inherit my anxieties which I didn’t realise he picks up on so easily. And it is for this reason, I am reminding myself (first and foremost) and all of you, to let them be! Just let them be kids! There is no need to rush off to a specialist at the first sign of behaviour you find strange…. heck who’s to say what is ‘normal’ and what’s not. 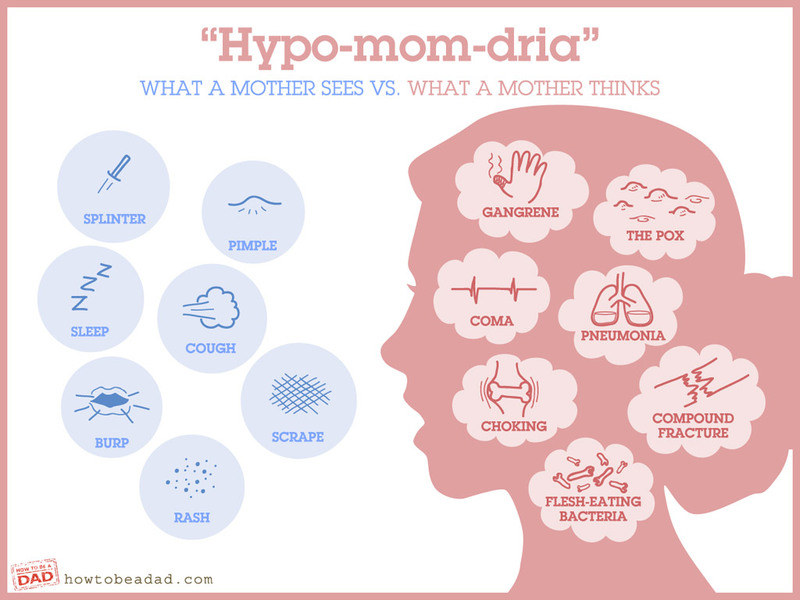 I think there is a fine line between an actual behavioural issue, and a mother who is convinced her child isn’t up to scratch because he/she hasn’t rolled over/ sat up/crawled/walked/potty trained/spoken/read/write as yet….so I ask: Are we too quick to diagnose and medicate our kids based on our own fears and unrealistic expectations? I have just heard of 8 year old diagnosed as bi-polar, now– I don’t mean any offence, but seriously?? In my opinion ALL children are bi-polar (or show many symptoms at least)!! Ask any mother that has teenagers?! And don’t even get me started on ADD/ADHD and how quickly our children are being labelled, a lot of the time, by US. Like I said, and I will keep repeating, that there really are genuine cases, and of course it’s your responsibility to care for your child and so this post is NOT aimed at those mothers with genuine problems. It is aimed at mothers like ME- who use Google amongst other things to self-diagnose themselves (yes I diagnosed myself with many different diseases over the years) and their kids. Whereas in reality, most 3yr olds are energiser bunnies , who are bouncing of walls (sofas in my case), and who can barely concentrate for more than 2minutes at a time… and for the mothers who rush off to the GP because their child sneezed and coughed ‘abnormally’ often the day before and now believe their child is ‘sick’. What I’m trying to say is…. let’s ease up a bit. Let’s allow our kids to get ‘sick’ without dosing them up with antibiotics. Let’s allow them to dig in the dirt and not worry about the germs they might pick up. Let’s wait until there’s serious issues before we rush of to specialists who insist they need therapy. Let’s treat the possibilities of problems in a child-centred manner. Let’s not make them OCD, or have panic attacks about routines, or have to take mountains of pills every morning. Let’s allow them to sneeze without shoving cortisone sprays up their noses. Let us not make them believe that there’s something ‘wrong’ with them. Let’s allow them to be who they are, and accept them that way. Let’s allow them to have fun, and be as kids are, inquisitive, full of joy and love and almost always…. uncontrollable. And most importantly….let’s be a little kinder to ourselves… there is no perfect child and there is definitely no perfect mother… we are all perfect in our imperfections! Much to the happiness of mothers in SA schools have reopened! Who would have thought we’d so happily welcome the taxi driving, making lunch, doing homework (not yet for me) routine. We have successfully survived the December holidays with slightly heavier waist lines and a little less sanity than we started out with…nevertheless- We have Survived! Now that the kids are back at school and you might find that you have a bit of free time. I’m all for creativity and find that the act of painting, beading, mosaic-ing, decoupage… or whatever craft you choose has a soothing effect on the mind and soul. Although I will gladly admit I’m not the most talented, I try, and as I learn I find it more than enjoyable. This post is to hopefully inspire all of you that feel you may ‘not have it in you’ to give it a try as well. It is a wonderful project for beginners as it does not require any technical skills and is suited to mothers as we have mastered the cutting and pasting while working on the children’s school assignments. It is definitely worth checking it out. This is my attempt. I received the link through my younger sister but didn’t really have the time to pay attention to it. While shopping for bath mats (at Sheet Street) I came across a wall sticker that I absolutely loved. I held it in my hand not knowing where in my house I would use it. While debating possibilities for the sticker, my sister reminded me of the link she had sent and said it would be perfect for this particular project. 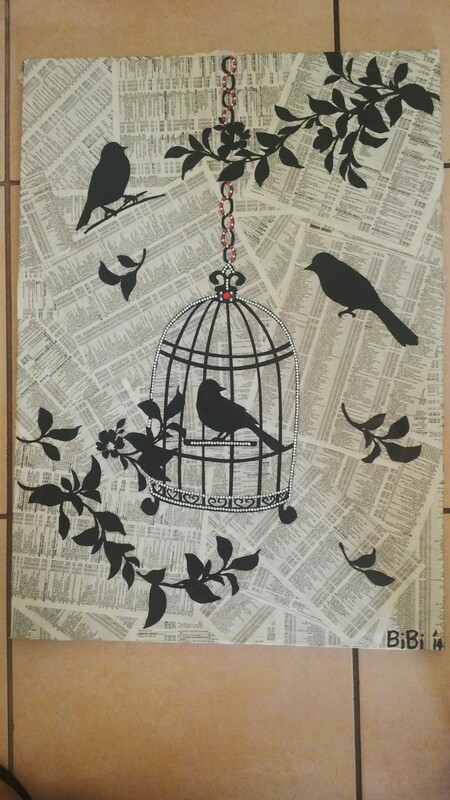 This was a combined effort between myself, my youngest sister Fathima and my older sister Rizwana (the natural artist in our family) who suggested we hand-draw the flowers/birdcage ourselves…..err NO thanks….I did not need my canvas to look like it was done by my 3yr old as that’s the level of my drawing capabilities- so we stuck with the wall sticker. 2. Cover your canvas with newspaper, giftwrap or telephone directory paper using craft glue which dries clear. We purchased a canvas (a printed one which we had to repaint- because we love making additional unnecessary work for ourselves lol). 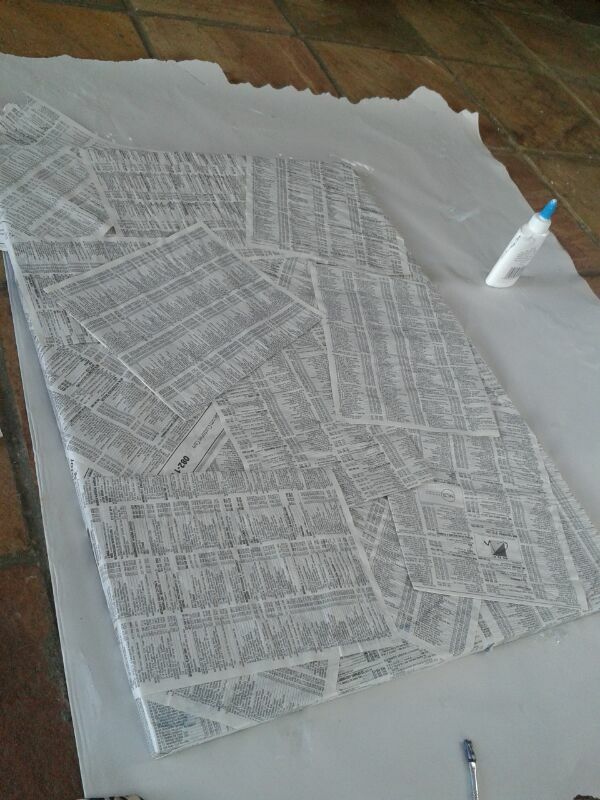 We used an old telephone directory and pasted the pages randomly over the wet paint. We covered the canvas with at least 3 layers of telephone book paper using glue to stick the 2nd and 3rd layers of paper. 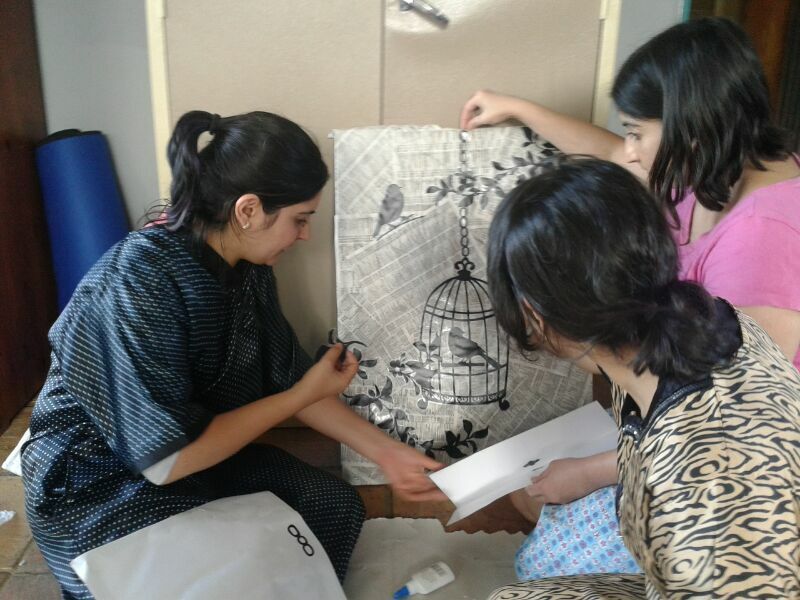 We then carefully peeled away the wall sticker and placed it onto the canvas in stages. First the chains of the cage, then the leaves coming from the right, more chains, the birdcage, leaves from the left and lastly the individual leaves and birds. This is my completed version. I have also been working on a word wall for our lounge/TV room, using wooden words that are covered with scrap booking paper. This is also a ‘beginner’ project should you wish to attempt it. As you go along you will find crafting quite addictive and instead of buying wall pieces, give it a try, you may surprise yourself, and add a gorgeous personal piece to your home 🙂 I will post those pics once the wall is complete. Ps. I thought a change in subject matter for the blog might be nice… that and the fact that my boys have not provided me with enough writing material….wow they are growing a little too fast! This post is dedicated to my sister Rizwana, who has helped me discover the creativity hidden inside me. Happy Birthday!